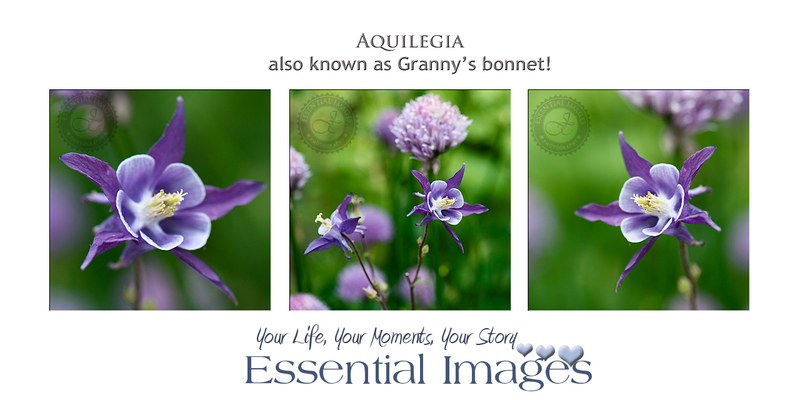 Did you know that the pretty little aquilegia that spreads itself very prettily and rapidly is otherwise known as 'Granny's Bonnet'? And the name 'aquilegia' is derived from the Latin word aquila, which means eagle! Anyway what on earth brings me on to this today? It's because it has been so hot indoors today sitting at the computer editing baby photographs from yesterday's shoot - I wandered out into the garden for some light relief! Aquilegia is growing like a weed out there! So I thought I would dig a few up - as pretty as they are there are other plants that would like to have some room too! :) And most of the flowers are now dying off! So quickly before they all disappeared I took a couple of photos of this pretty little plant in amongst the garlic chives! By the way, if anyone would like prints of any of my floral art, please get in touch for sizes and prices!